It seems like a lot of churches approach family ministry as tweaks or a new spin on their existing programs, but it’s obvious that what a church truly believe about family influences much more than programs. It’s apparent in how they recruit volunteer help, what they expects from members, and even how they conduct worship services. What is the role of the family in the local church? And is that different from the role we typically have them fill? When I asked this on Facebook yesterday, I surprisingly got almost no responses. 1. The Family-Integrated Ministry model is characterized by its removal of age segmented activities with all families, infants to parents, worshipping together. 2. The Family-Based Ministry model maintains the age segmented programs and activities of most churches, yet intentionally provides curriculum, activities, and events designed to draw the generations together. 3. 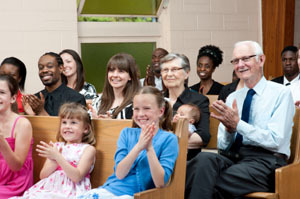 The Family-Equipping Ministry model may retain youth ministry and the Sunday School hour, but every activity and function of the church is focused on championing the parents as the primary disciple-makers in the children’s lives, while at the same time the parents recognize and embrace the church as an active partner in the process. What’s interesting to me is that each one of these models actually reveal something about what that model believes about the role of the family in the local church. As youth workers, I feel like we need to back off of all the “how to” family ministry integration we’re pursuing and answer a more fundamental question, “What is the role of the family in the local church?” After we have a clearer understanding of what it is we believe about family and the role a family should play in the church, only then can decide the practical implications of how to appropriately integrate the family unit into the church’s ministry. QUESTION: What do you think each family ministry model says about the role of the family in the local church?